It is years since tracks changed from cinders to shale and the recent fiasco in Warsaw highlights the need to move with the times and develop a synthetic coating which can be applied to a solid base. For example a timber base that which would be assembled, rather than laid, consequently providing a rut free uniform surface on which the riders can confidently apply their skills. This would result in more enjoyment for both riders and fans and a much better spectacle. Surely if we can put a man on the moon the development of such a technique is not an impossible dream and offers many advantages to the sport? The "coating" would need to be one that required watering in order to cater for varying weather conditions and the structure would be designed to cater for banking of the track. Transportation of the assembly between venues would be more difficult than the current truckloads of shale but you would get a guaranteed result. 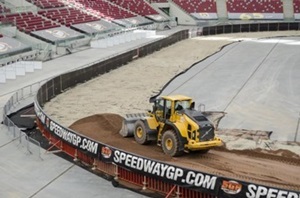 The "thrills" of watching the grader go round and round would be eliminated but replaced with actual racing and with more events and a better spectacle Speedway could return to its former category of being a major sport.